The nation is immersed in a years-long debate over immigration, with tempers flaring on both sides of the issue. Texas is at the heart of the immigration debate, thanks to the long stretch of border it shares with Mexico. Just months after troops traveled to the southern border of the country to stop a migrant caravan over Thanksgiving, troops and law enforcement officers are again waiting to stop a caravan of migrants coming from Central America. Roughly 1,800 migrants are waiting across the Rio Grande in Piedras Negras after traveling to the border in over 50 buses. Though the migrants hope to enter the United States, they are being held back by the Department of Public Safety and the U.S. military. As the would-be immigrants live in a warehouse that has been converted into a temporary shelter, the government urges them to wait until their paperwork has been processed. Per the director of the Eagle Pass Port of Entry, the port can process between 16 to 20 cases each day. Currently, about 500 Texas officers are guarding the border alongside 250 military troops. 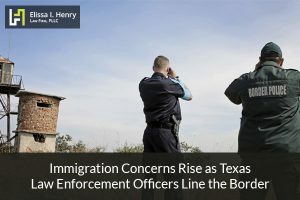 While this situation has led to some calling for more flexible immigration policies and faster processing of paperwork for those legally trying to enter the country as refugees, it has also led to those in support of a border wall pushing for stricter border security laws or a closed southern border. Increased Anxiety for Immigrants Already in the U.S. Whenever immigration laws are in the public eye, those already residing in the country often experience greater levels of stress and anxiety. There have been reports of legal immigrants or citizens being stopped at ports of entry and being forbidden re-entry to the United States, and many worry that their legal status could be revoked if the government tightens its restrictions. The situation is even more perilous for those still waiting for documents that allow them to legally enter the country. Those with jobs or family members sponsoring their entry to the company may find that they have longer wait times, additional documentation requirements, or other circumstances that lead to untimely delays. The status of your immigration case can change the course of your entire life, which is why it’s crucial to seek appropriate legal counsel. Trying to go through the process on your own can cause your case to be delayed or denied, thanks to the detailed documentation and entry requirements you must meet. Consulting with an attorney for your spousal, adoption, family, employer, or fiancé visa can make everything go more smoothly. At Elissa I. Henry Law Firm, PLLC, we work hard to unite families and handle tough immigration issues. Call our office today at (512) 766-4529 to speak with our immigration lawyers in Round Rock, TX about your case. What is a Motion to Reconsider in an Immigration Application?